How to move-In the tenant? A Move-in consists of Tenant information, Move-in information, Insurance and Services, Merchandise and Payment details related to the tenants during the time of renting a unit. 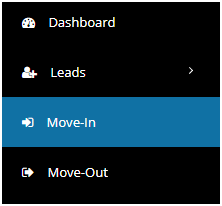 By Clicking on Move in, the Tenant information page will resemble with options such as Existing Tenant,New Tenant and Reservation. By clicking on New Tenant, You will able to fill up the basic information of particulars like Name, Tax ID, Address, contact number and Identity documents. Having filled in all fields in the tenant page, the Move in page will follow to get the unit details relating to the particular tenant. It is easy to automate the invoice date and to set invoice recurring. By hitting save, you will be able to see the confirmation page of the lease created.